A former German army lieutenant who took part in a plot to assassinate German leader Adolf Hitler in 1944 has died. 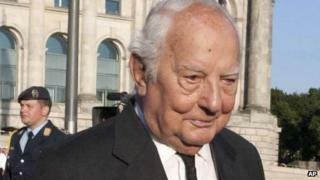 Ewald-Heinrich von Kleist died aged 90 at his home in Munich last Friday, his wife Gundula told the Associated Press. Mr von Kleist was just 22 when he volunteered to wear a suicide vest at a meeting with Hitler. The meeting did not come off, but months later he played a key role in what became known as the 20 July plot. He was supposed to carry a briefcase packed with explosives to a meeting with the Nazi leader, but in a change of plan the bomb was planted by plot mastermind Colonel Claus von Stauffenberg. Col von Stauffenberg - played by Tom Cruise in the 2008 film of the plot, Valkyrie - placed the bomb in a conference room where Hitler was meeting his officials inside the "Wolf's Lair", Hitler's command post in East Prussia. But, the plot did not go to plan - the briefcase was moved out of the way and Hitler escaped the full force of the blast. Col Von Stauffenberg, along with von Kleist's father - a known opponent of Hitler - and others involved in the plot were arrested and later executed. Ewald-Heinrich von Kleist was arrested and sent to a concentration camp, but was later allowed to return to combat duty. Born in 1922 in an area of north-eastern Germany that is now part of Poland, Mr von Kleist came from a long line of Prussian landowners. While an infantry officer, he was approached by Col von Stauffenberg - who suggested he wear a suicide vest under a new uniform he was due to be modelling for Hitler. Mr von Kleist later recalled how his father gave his blessing to the suicide mission. "Fathers love their sons and mine certainly did, and I had been quite sure he would say no. But as always, I had underestimated him," he said. The meeting with Hitler never happened. In later life, Ewald-Heinrich von Kleist founded the annual Munich Conference on Security Policy - a powerful forum that brings together the world's top diplomats and defence officials to discuss global policy issues. US Senator John McCain paid tribute to his "friend of three decades", saying: "I learned a great deal over the years from Ewald's wise counsel and statesmanship. I enjoyed the great pleasure of his company and the privilege of his friendship, for which I will always be grateful."